La Mirada High School senior Isaac Cantu is vigilant as he stencils the words “Dream Big” along the side of one of four garden boxes that he and three other students made in their woodshop class. When Cantu and seniors Johnny Granados, Andrew Iabarra and Spencer Collins finish the garden boxes, their hours of craftsmanship will house dozens of plants, flowers, fruits and vegetables to beautify the grounds of the Casa Youth Shelter in Los Alamitos. The Casa Youth Shelter provides temporary shelter and counseling for homeless, runaway and abandoned youths in crisis with the ultimate goal of family reunification. The idea of donating garden boxes to the youth shelter originated from La Mirada High counselor Ila Patterson, who says gardening is a therapeutic hobby for those willing to develop their green thumbs. Patterson coordinated with the school’s woodshop teacher, Ken Yoshioka, to gather student volunteers to build the boxes. 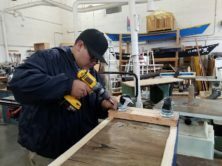 Yoshioka said he jumped at the chance to offer the project to his students because it would both fulfill a philanthropic purpose and allow the students to see that their woodshop abilities can have practical applications. When Patterson donates the completed boxes, fully painted and adorned with more slogans and the Casa Youth Shelter name, she also plans to donate an assortment of seeds so that the youth shelter residents can grow their own gardens. 053017_NLMUSD_GARDENBOX1: La Mirada High School Senior Andrew Iabarra uses a power drill to secure wheels onto the bottom of a garden box, which will be donated to the Los Alamitos Casa Youth Shelter to beautify the grounds with plants, flowers, fruits and vegetables. 053017_NLMUSD_GARDENBOX2: La Mirada High School Senior Spencer Collins drills holes for support screws into the side of an unfinished garden box, which will be donated to the Los Alamitos Casa Youth Shelter. 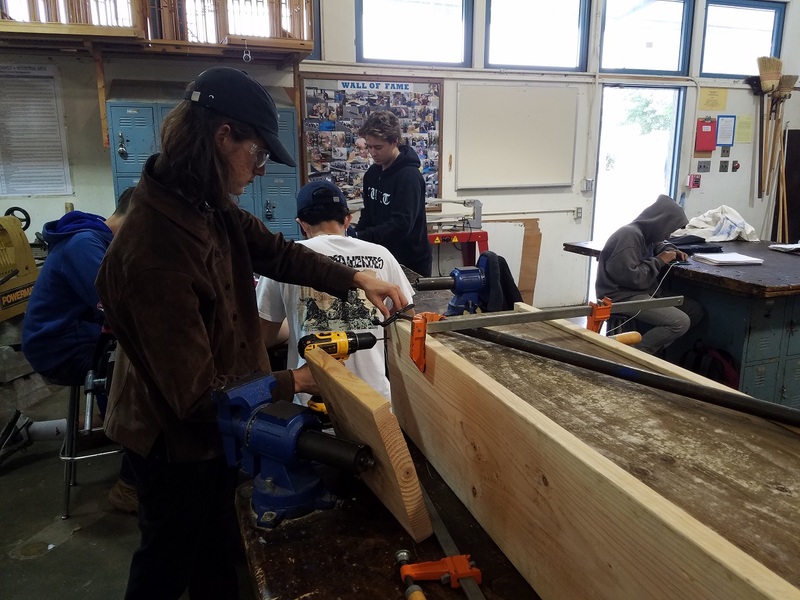 Collins and three other students volunteered for the project and are building the boxes using tools from their school’s woodshop. La Mirada High School Senior Andrew Iabarra uses a power drill to secure wheels onto the bottom of a garden box, which will be donated to the Los Alamitos Casa Youth Shelter to beautify the grounds with plants, flowers, fruits and vegetables.